Before diving into configuration let me first describe what AAA is all about. AAA stands for authentication, authorization and accounting, a system in IP-based networking to control what computer resources (routers,switches, firewalls, wireless access points, WLC, WCS) users have access to and to keep track of the activity of users over a network. Authorization is the process of granting or denying a user access to network resources once the user has been authenticated through the username and password. The amount of information and the amount of services the user has access to depend on the user’s authorization level. Accounting is the process of keeping track of a user’s activity while accessing the network resources, including the amount of time spent in the network, the services accessed while there and the amount of data transferred during the session. Accounting data is used for trend analysis, capacity planning, billing, auditing and cost allocation. AAA services often require a server that is dedicated to providing the three services. RADIUS, TACACs are an example of an AAA service. In my post i am using 2 ACS box running in high availability in Global Data Center for AAA and using Microsoft Active Directory as a database for end user authentication. Now lets dig into configuration. Local-user unetadmin –>This sets the local user, in case ACS server fails. authorization-attribute level 3 –>Level 3 is the highest level in HP A series, like privilege 15 in cisco devices. super password level 3 cipher rainwater –>This is like Enable password in cisco. Authentication-mode scheme –>It means we are using AAA scheme. user privilege level 3 –>If authentication by AAA user will be directed to privilege 3.
hwtacacs scheme acs –>We need to define a scheme first. primary authentication x.x.x.x –>Where x.x.x.x is primary ACS server. 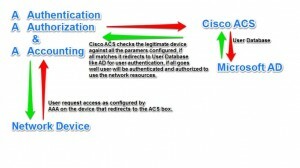 secondary authentication y.y.y.y –>Where y.y.y.y is secondary ACS server. key authentication HP_ASeries –>Key should match with the key configured in ACS box. Note:- This is case -sensitive. nas-ip z.z.z.z –> This is the source of the AAA conversation from the device to the ACS box, either it should be management interface or the ip that is configured on the ACS box for this particular device. domain upm_acs –>Configured “scheme” should be embedded into a “Domain” to define the hierarchy for AAA. authentication default hwtacacs-scheme acs local –>This means the AAA will first try ACS primary then secondary and if both fails then local. user-group upm_acs –>We need to define user-group as same as Domain name. domain default enable upm_acs –>This is the main command to enable the domain for AAA, in case if we have multiple domain configured, like one for TACACS, other for Radius. password manager user-name –>Manager is highest level of access in HP E series. aaa authentication login privilege-mode –>Login straight into Manager mode, no need to type “Enable” after successful login. aaa authentication telnet login radius local –>This means for telnet AAA will first try ACS primary then secondary and if both fails then local. aaa authentication ssh login radius local –>This is for SSH. radius-server host x.x.x.x key HP_ESeries –>Define primary Radius server host and the key. radius-server host y.y.y.y key HP_ESeries –>Define secondary Radius server host and the key. ip source-interface radius z.z.z.z –>This is the source of the AAA conversation from the device to the ACS box, either it should be management interface or the ip that is configured on the ACS box for this particular device.